The Hanging Belt and Tie Organizer is a perfect way to arrange ties belts scarves and other clothing accessories in a convenient way that takes up very little closet space. Made from stainless steel and finished in brushed nickel this durable tie rack includes nine hooks to sort and store a multitude of accessories. Measuring 14 inches long the belt and tie holder is also great for hanging hats bags and even small purses. 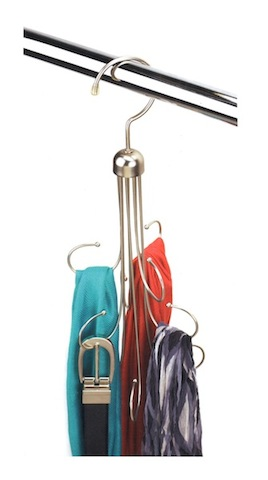 Hanging Belt and Tie Organizer Features Crafted from stainless steel and finished in brushed nickel this tie rack will not tarnish or discolor under normal conditions. Measures 14 inches long and includes 9 hooks for plenty of space-saving storage. This belt and tie rack is not just for men it works equally well with women's fashion accessories such as scarves and even small purses. The Hanging Belt and Tie Organizer makes a great gift for anyone who could use a little organization in their closet.